High in the mountains of La Salette-Fallavaux, north-east of Corps, Notre-Dame de La Salette is located where Our Lady is believed to have appeared to two children in 1846. 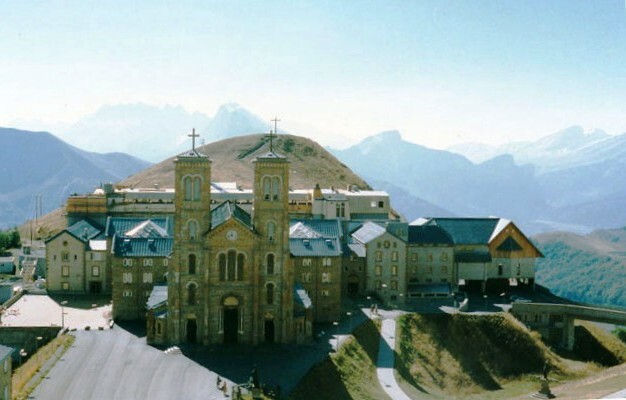 The sanctuary of Notre-Dame de la Salette comprises a basilica and other buildings (including a hotel) which were erected on the site of the reported apparition at an altitude of 1800 metres (5900 feet) between Mt Planeau (1804m), Mt Gargas (2208m), Mt Chamoux (2198m) and the Cross of Rougny (2258m). The Basilica of La Salette, designed by architect Alfred Berruyer, was erected from 1852. The nave of the building was finished in 1865 and the church was consecrated as a minor basilica in 1879. Its side chapels were not completed until 1894. Bronze statues depicting aspects of the apparition were placed on the grounds of the site in 1864. St Peter Julian Eymard’s close association with Notre-Dame de la Salette is commemorated by a small, modern chapel within the shrine complex. La Salette is a place of religious pilgrimage, attracting over 300,000 visitors each year. It is a precursor of the modern apparitions of Our Lady reported at Lourdes in 1858 and Fatima in 1917. 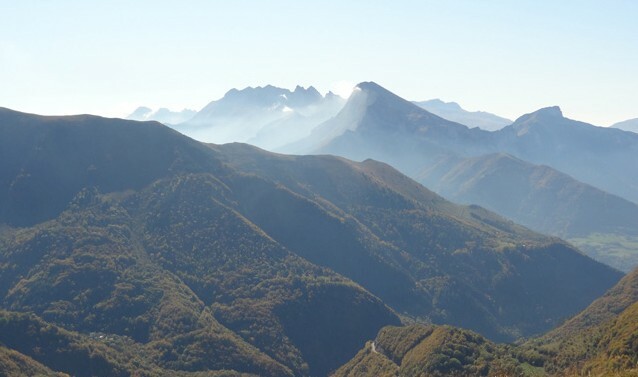 On 19 September 1846, fourteen-year-old Melanie Mathieu-Calvat and eleven-year-old Maximin Giraud were tending cattle on the alpine pasture near Mount Gargas when they saw a ball of fiery light on the ground. It was, they later said, ‘as if the Sun had fallen there’. In terror, they watched as this ball of light surged and opened up to reveal the figure of a woman who was seated with her elbows on her knees and her head in her hands. The ‘Beautiful Lady’, as Melanie and Maximin described her, seemed to be made entirely of light. With a voice that ‘sounded like music’, she reassured the children and asked them to come closer. ‘I am here to tell you great news’, the woman said. She explained that she had long been suffering on behalf of her people, holding back the arm of her Son, praying and pleading with Him not to abandon them because of their sinfulness and indifference. Throughout her conversation with the children, tears were streaming down the woman’s face. Each child was given a secret message that the other could not hear. ‘Well, my children’, she said, ‘you will make this known to all my people’. As she moved away and began to merge into the light, the woman said again: ‘Well, my children, you will make this known to all my people’. The children at that time had no idea who the woman was. They wondered whether she might have been a saint. When they returned to their village below the mountain and spoke of their experience, they were astounded that nobody else had seen the bright light. Not surprisingly, many of the locals were sceptical, but some were convinced from what the children said that they must have seen the Virgin Mary. Within a day, the first pilgrims were making their way up the ‘holy mountain’ to the site of the reported apparition. Within a year, on the first anniversary of the apparition, 50,000 pilgrims were gathered on the La Salette site. Our Lady of La Salette wore a unique cross around her neck, featuring a hammer (symbolic of the instrument of Christ’s crucifixion) and pincers (symbolic of the removal of the nails of the cross through penance, prayer and reconciliation with God). 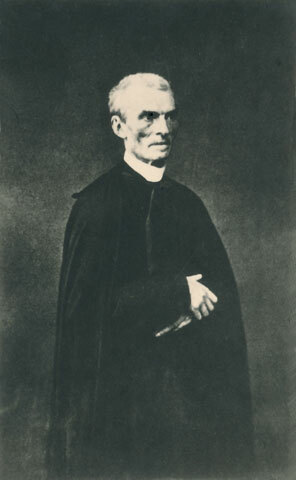 Over the next five years, an exhaustive enquiry into the apparition was conducted by Bishop Philibert de Bruillard of Grenoble (the same bishop who had ordained Peter Julian Eymard in 1834). As a result of this enquiry, Bishop de Bruillard announced in 1851 that the apparition was likely to be a true revelation and he authorised the commencement of the cult of Our Lady of La Salette. Soon after this announcement, the Missionaries of Our Lady of La Salette were founded in 1852 as an apostolic religious congregation dedicated to reconciliation and to promotion of the virtues of prayer, penance and zeal that were central to the call of Our Lady of La Salette for conversion. Together with the Sisters of Our Lady of La Salette (established in 1930), the Missionaries maintain the sanctuary at La Salette in France and they work to promote Our Lady of La Salette’s message of reconciliation and conversion throughout the world. During the 150th anniversary year of the apparition in 1996, Pope John Paul II described La Salette as ‘a message of hope, a hope sustained by the intercession of her who is the Mother of all peoples’. For Peter Julian Eymard, La Salette was a place of great religious significance from almost the moment he first heard of the reports of what happened there. La Salette was an event that occurred in Eymard’s lifetime and in his own part of the world. In correspondence with his sisters in December 1846, where he observed that some people were ‘making fun’ of the children’s story, it is clear that Eymard recognised and accepted the miraculous nature of La Salette from the outset, long before the church had formally investigated the event and before he had ever visited the place. I am writing you a few words from the Holy Mountain where I came to thank the Blessed Virgin and pray for the Society. Here I am at La Salette, at the feet of the Blessed Virgin; ten years ago, I came to place the plans for the Society at her feet; it’s only right that I should offer her the first fruits. The Work of the Most Blessed Sacrament is still in the ground and germinating. Pray for it. In the early 1850s, there were many occasions when Eymard and others were nurturing the seeds of Eucharistic projects that might have resulted in a religious society dedicated to the Blessed Sacrament. But it is significant that, when Eymard was confident that the project had borne fruit, it was to La Salette that he returned in 1863 to give thanks for the plans that he had placed ‘at the feet of the Blessed Virgin’ ten years earlier. I am ready to confirm it with the full authority of my faith. If I did not have the happiness of being a Marist, I would ask my Bishop, as a special favour, to let me consecrate myself body and soul to the service of Our Lady of La Salette. I had the joy of being the first person in Lyon to proclaim the miraculous event of the Apparition, and I am happy today to kiss, with love and gratitude, this blessed earth, this mountain of salvation. The special significance of La Salette for Eymard was maintained to the end of his life. On 18 July 1868, when Eymard had suffered a stroke and was making his final journey to La Mure, he celebrated what would be his last Mass at the Adoration Chapel of the Missionaries of La Salette in Grenoble. He died on 1 August 1868 at La Mure, clutching a small statue of Our Lady of La Salette to his heart. Photographs of La Salette France: La Salette Missionaries (USA) by theme groupings: Hiking; Flowers and Animals; Mass and Exposition; Mountains; Snow; Stations of the Cross; Statues; Sunsets; Shrine Exterior; Shrine Interior. Charles Dickens, ‘History of a Miracle’ Household Words, 26 June 1858 (vol. 18, no. 431, pp. 37-42) : Full text view or download at Google Books (Public Domain). Or click the title below the reader to view full-screen online at the Internet Archive. Navigate to pages 37-42 in the publication. William Bernard Ullathorne, The Holy Mountain of La Salette: A Pilgrimage of the Year 1854 (London: Richardson and Son, 1854): Full text view or download at Google Books (Public Domain). Or click the title below the reader to view full-screen online at the Internet Archive.